In the classroom setting, many of our students who have difficulty with auditory processing or who are hard of hearing have a hard time in the classroom setting with background noise. They often cannot hear/process information or directions in the classroom with background noise from the lights, children talking, outside noise, and more. Auditory Figure Ground helps children learn to listen for and process information with background noise. Continue reading to learn more about this application and enter to win a copy! Pressing the "Start" button on the Main Page will begin the application. Pressing the "i" button will bring you to the information page. This page discusses the purpose of the application, population to use the application with, how to use the aplication, the sound-noise ratio, and some tips. After pressing the "Start" button, a screen will appear with two scroll wheels to choose the type of background noise (children's indoor playground, elementary school children in the lobby, noisy crowd walking and talking, small cafe ambience, white noise, or quiet without background noise) as well as the sound-noise ratio (12 dB, 8 dB, 4 dB, 0 dB, or -4 dB). Once you have adjusted the settings, press the "Apply Noise Settings" button. Pressing the "i" button on this screen will show more information on how to use the app during application play. Press the "Shuffle Cards" button to return to the noise settings menu. Press the "Mute" button to mute the noise. Press the sound waves to hear the word repeated. Four cards will appear on the screen with images on them. If the user would like to read the word, he or she can flip a card over by pressing on the arrow corner of a card. 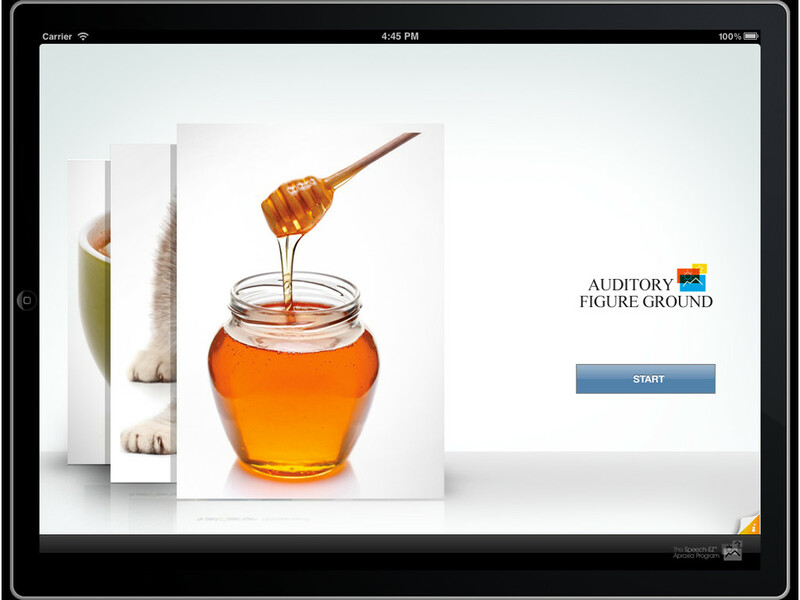 There will be background noise during application play to make it more difficult for the user to hear a target word. Once the target word is stated, the user must press the associated card. If the user chooses the correct card, it will highlight in blue. If the user chooses the incorrect card, it will appear faded. Swipe from right to left to view the next set of cards. The cards may also be similar in rhyme or sounds (such as "knob", "knot", "cob", and "knock"). Press the "End Session" button when you have completed the session. Once you press the "End Session" button, it will go back to the main screen. 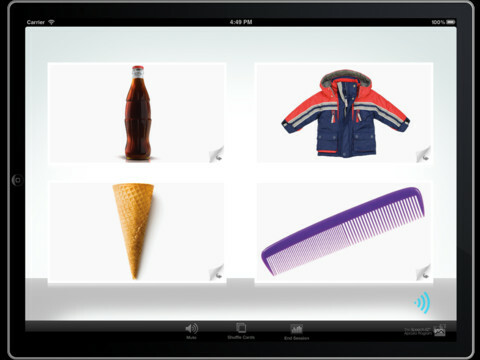 The application uses both images and words for children to determine which word was stated by the app. 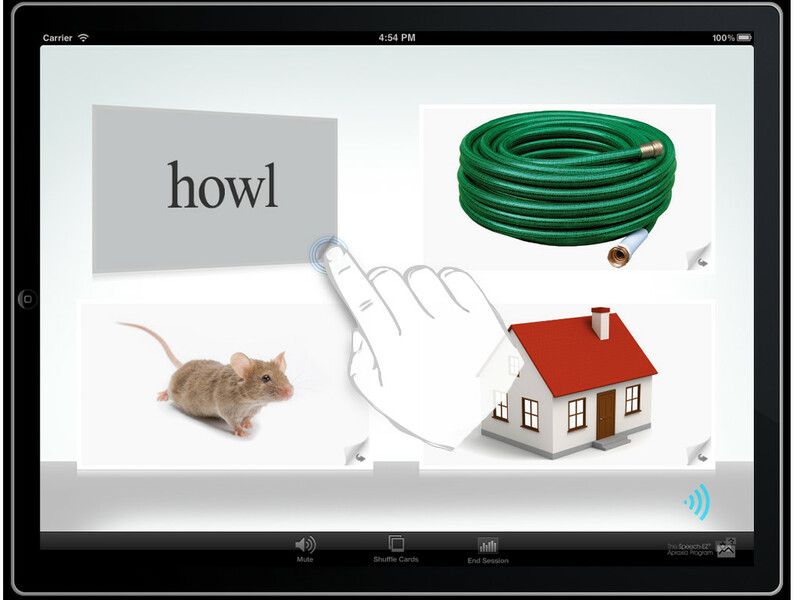 This application imitates real life situations where it might be difficult for a person with a hearing impairment or auditory processing disorder to understand words stated aloud due to background noise and allows them to practice in a relaxed environment. The application is clean and free of visual distractors, so it does not add to the background noise. Sound noise ratios and background noise types can be adjusted as there are many different options. I always say this about apps, but I defiinitely love apps that include data collection and multiple profiles. It is always extremely helpful! Hearing/Auditory Processing - Adjust the sound noise ratio depending on the students' needs as well as the background noise to work on listening and auditory processing skills to determine the word stated. Expressive Language - Have the child create a sentences using each of the words shown or the word stated. Memory Skills - Have the student repeat back the word stated by the application. Another way to use the app for memory skills is to show the four images on the page, then turn off the screen and see if the person can recall all four images. Receptive Language - Children can learn various vocabulary terms by listening to and reading the images/text on the cards. 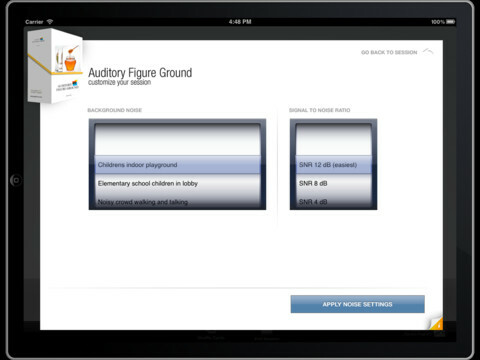 Auditory Figure Ground is available for the iPad for $29.99. Consonantly Speaking was given an application code to give away with this review. No other form of compensation was given. Come back for a giveaway of this amazing application!